(Nanowerk News) Scientists at the University of Sheffield have created a computer model of how bees avoid hitting walls – which could be a breakthrough in the development of autonomous robots. Researchers from the Department of Computer Science built their computer model to look at how bees use vision to detect the movement of the world around them and avoid crashes. Bees control their flight using the speed of motion - or optic flow - of the visual world around them, but it is not known how they do this. The only neural circuits so far found in the insect brain can tell the direction of motion, not the speed. This study suggests how motion-direction detecting circuits could be wired together to also detect motion-speed, which is crucial for controlling bees’ flight. “Honeybees are excellent navigators and explorers, using vision extensively in these tasks, despite having a brain of only one million neurons,” said Dr Cope, lead researcher on the paper (PLOS Computational Biology, "A Model for an Angular Velocity-Tuned Motion Detector Accounting for Deviations in the Corridor-Centering Response of the Bee"). 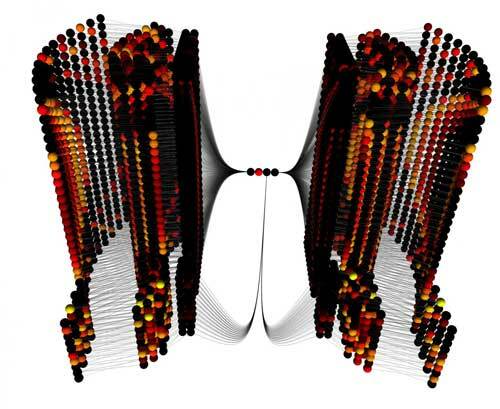 “Understanding how bees avoid walls, and what information they can use to navigate, moves us closer to the development of efficient algorithms for navigation and routing - which would greatly enhance the performance of autonomous flying robotics”, he added. Dr Cope and his fellow researchers on the project; Dr Chelsea Sabo, Dr Eleni Vasilaki, Professor Kevin Gurney, and Professor James Marshall, are now using this research to investigate how bees understand which direction they are pointing in and use this knowledge to solve tasks.